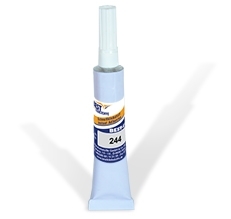 BEST-CA 244 is a one-component, solvent free cyanoacrylate adhesive based on ethyl-cyanoacrylate. BEST-CA 244 is the standard product for bonding of plastics, e.g. polyamide, PVC, PMMA, and various elastomeres, e.g. rubber, EPDM and viton amongst each other and with metals and ceramics. Due to the high viscosity the product is specially designed for bonding of porous surfaces as well as working overhead and on vertical or sloped surfaces. BEST-CA 244 is very fast cure. After full cure the adhesive is high strength and temperature resistant. BEST-CA 244 is ready-to-use and can be applied from the original container. BEST-CA 244 is applied spot-wise or bead like. Assemble parts by using short, firm pressure. Curing process starts within seconds. On most materials fixture time is reached within 15 to 25 seconds. 85 % of final cure is reached after 30 minutes, 100% after 20 hours. The rate of cure depends on the ambient relative humidity. A relative humidity of 40 to 60% will lead to best results. Lower values may delay cure.